"The Second World War allowed for the utilization of an unprecedented number of dogs for military duties, both internationally and among the British armed forces. On the British home front, civilians responded to calls from the British Army's War Dogs Training School and the Ministry of Aircraft Production Guard Dog Training School by donating their canine pets for military training and employment "for the duration." As dogs were instructed in roles with the British Army, the Royal Air Force, and the London Civil Defense Region, the distinction between pet and trained working animal became increasingly unclear. While civilians and servicemen alike continued to view military dogs as pets, many also saw trained canines as humanlike soldiers "doing their bit," a depiction promulgated by both the military and the wartime press. Despite the contributions of military and Civil Defense dogs, historians have paid little attention to their employment by the British armed forces and on the British home front in the First and Second World Wars. In the first comprehensive scholarly account of the employment of British military and Civil Defense dogs in the Second World War, Kimberly Brice O'Donnell traces the development of the British military dog scheme from the British Army's belated establishment of the short-lived War Dog School and the Messenger Dog Service of the First World War to the more recent employment of canines during the wars in Iraq and Afghanistan in the early 21st Century. 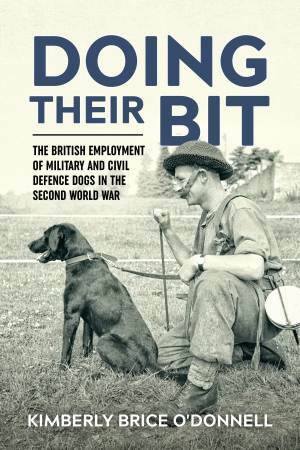 With a focus on the Second World War, Doing their Bit examines why and how dogs were trained and employed by the British armed forces and the London Civil Defense Region, and how humans shaped and perceived their use. Utilizing a range of archival material, O'Donnell analyses the performance of guard, military police, patrol, mine detection, and rescue dogs in training and on operations by considering the advantages and disadvantages of utilizing canines in such roles. Military and Civil Defense dogs offered a number of advantages over the employment of humans and technological equipment, and the experience gained by dog trainers and handlers during the Second World War led to the continued employment of canines in the post-war period. While the use of horses and other animals has since diminished, the Second World War marked a turning point in the history of the British military dog, ushering in the seemingly permanent training of dogs for police and military roles.